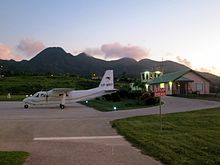 Montserrat Airways Ltd (MA LTD), trading as FlyMontserrat, is an airline with its headquarters at John A. Osborne Airport in Gerald's, Montserrat, British West Indies. The airline flies from Montserrat to and from Antigua, Barbuda and Nevis with their Britten Norman BN-2 aircraft. On 28 May 2009 the airline received its Air Operator's Certificate from the UK overseas Civil Aviation Authority Air Safety Support International (ASSI). On Saturday 30 May 2009 the airline's first charter flight took place. The Montserrat Tourist Board British Department for International Development (DFID) and the Tourism Challenge Fund, sponsored by the government of Montserrat, provided the funds to start the airline. On 19 April 2011 a Fly Montserrat aircraft ran off the runway and turned into the mountain ridge after the aircraft developed brake trouble upon landing. On 7 October 2012 a Britten-Norman Islander, operating as FlyMontserrat Flight 107 to John A. Osborne Airport, crashed at V. C. Bird International Airport in Antigua and Barbuda seconds after take off at 4:15pm. The pilot and one of the three passengers died in the crash; another passenger died later in hospital. A Preliminary Accident Report stated that the right engine was not operating and the propeller was not feathered; and that "significant quantities" of water had been found in the fuel supply to the aircraft's starboard engine. On 16 October 2012, another of the airline's planes ran off the runway at the John Osborne Airport in Montserrat. ^ "About Us." FlyMontserrat. Retrieved on 8 October 2012. ^ "Contact Us." FlyMontserrat. Retrieved on 8 October 2012. ^ "Schedule." FlyMontserrat. Retrieved on 5 May 2013. ^ "Fly Montserrat begins operations". Montserrat Airways at Easier Travel Ltd. 3 June 2009. Retrieved 8 October 2012. ^ Denny, John. "MONTSERRAT AIRWAYS TO OPEN JUNE 1." The St. Kitts-Nevis Observer. 1 May 2009. No. 757. Retrieved on 8 October 2012. ^ "No injuries after FlyMontserrat mishap". Dominica News Online. ^ "Fly Montserrat Airplane Crash in Antigua reported." Spice Media Group. 8 October 2012. Retrieved on 8 October 2012. ^ Hradecky, Simon (16 October 2015). "Crash: Montserrat BN2P at Antigua on Oct 7th 2012, lost height after takeoff, contaminated fuel". The Aviation Herald. Retrieved 5 July 2017. ^ "Government of Montserrat- Montserrat in mourning after a tragic plane crash that killed three". gov.ms. Retrieved 13 October 2012. ^ Toni Frederick. "WINN FM - Fly Montserrat plane runs off runway". winnfm.com. Retrieved 29 October 2014. This Montserrat-related article is a stub. You can help Wikipedia by expanding it. This article relating to a North American, Central American or Caribbean airline is a stub. You can help Wikipedia by expanding it. This page was last edited on 12 May 2018, at 02:14 (UTC).